New Delhi: India has added 3.13 million ha of forests in the decade between 1997 and 2007, at the rate of 0.3 million ha every year, the latest forest survey of India has found. This compares with Brazil losing 2.5 million ha a year and China gaining an annual 4 million ha, environment and forests minister Jairam Ramesh said while releasing the survey, titled State of Forest Report, 2009. The survey is conducted every two years. Increasing forest cover needs various incentives and India will lobby for it at the global climate talks in Copenhagen starting 7 December. “The world must acknowledge this in any deal at Copenhagen," the minister said on Monday. The 2009 survey found that India’s forest and tree cover neutralize over 11% of its global warming gas emissions at 1994 levels. It goes on to add that this is equivalent to offsetting 100% emissions from all energy used in residential and transport sectors, or about 40% of emissions from farms. “This is a very significant amount," Ramesh said. For the first time, the report also provides numbers that take into account the tree line, an altitude above which trees are unable to grow and defined in this case at above 4,000m. 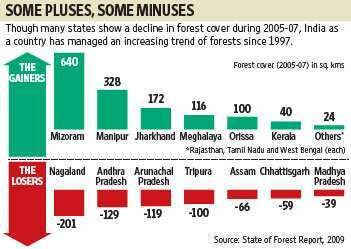 This significantly alters the forest cover in five states. If areas above the tree line are kept out of calculations, the forest cover in Himachal Pradesh increases to 44% from 27%, Arunachal Pradesh to 88% from 82%, Jammu and Kashmir to 33% from 12%, Sikkim to 84% from 46%, and Uttarakhand to 59% from 47%. India’s forest cover has also been mapped for the first time on the basis of 16 broad types and various altitudes. Forest and tree cover in the country was 78.37 million ha in 2007, or 23.84% of its geographical area. The cover, however, increases to 25.25% if areas above the tree line are excluded. Vijay Kelkar, chairman of the 13th Finance Commission, said at the release function that the next forest survey report should also include details on the contribution of forests to India’s economy in terms of goods and services.